5000 years later, we have a man named Vasu, who is much like Karna – illegitimate birth, very talented but denied all credits in life, rejected in love, misses a medal in the Asian games, gets caught for telling an innocent lie, overlooked for promotion. He begins to identify himself with Karna, and interestingly Karna appears to him after every debacle to assuage and encourage him. It seems Vasu is Karna’s alter ego. Some books are so good that you never want to leave them. They are not just the books but a life itself. 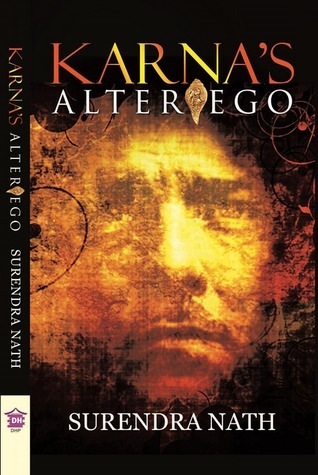 Such book is Karna’s Alter Ego by Surendra Mohanty. This book talks about a very simple boy who is living is a village and is finding pretty difficult to move on in his life and then suddenly his own alter ego guides him on his journey. This book is not about mythology of Mahabharata and even not a fiction only but is the blend of both. Basically this book talks about the ‘life’ and how it should be dealt with. This book takes you on a journey that talks about everything about Mahabharata but from other perspective, from Karna’s prospective and the meaning of those things in our today’s life. Author has developed both the characters so sensibly that sometimes you’ll get indulged in one of the character and will start to live the conversation between them. This is a kind of book that you’ll love to refer at some time of your life to find out the reasons and solutions of problems you’ll be facing in your life. The book ends with lots of things that author leaves for the readers to anticipate and that was the beauty of the story and the writing of the author. There's a lot to take from this book but in the end, it's all on the reader himself. This is a rare kind of a book and it should find a prestigious place on your bookshelf, for sure. I’ll rate this book 4.5/5. Thanks indeed for such a heart-warming review of my book.